Email Form Processor for all your contact forms. Safely and securely handles unlimited forms and fields, and validates user data-entry. This is an email forms processing script to collect feedback or other information from your visitors. Information that your visitors enter into your forms is then sent to an email address of your choice. Unlimited Forms: You can setup an unlimited number of different forms. Unlimited Fields: Each form can have as many fields as you want - including text fields, long text fields, radio buttons, check boxes, drop-down lists. Totally secure: Can NOT be subverted by spammers like some other formmail scripts. Protects your inbox form spam: If using this script, you do NOT need to visibly publish your email address on your site, and this helps protect it from spambots. Simple Validation: You can set up fields on your form to be validated against your own chosen set of rules, ensuring correct data-entry. Users will be helpful prompted before submitting the form to correct errors, for example, if you require the user enters their email address or website URL into a particular field, the user will be prompted to include a valid email address or URL in that particular field before they can submit the form. Prevents Double Submit: Many scripts can generate duplicate emails or worse problems if the user accidentally clicks the submit twice in quick succession. The form validation feature of the scripts prevent this from happening. Our company, Answers 2000 Limited, is the vendor of this Feedback Form PHP Script, and we sell this product exclusively through ClickBank. 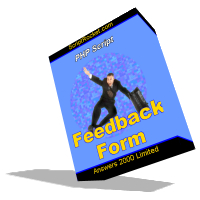 You can purchase Feedback Form PHP Script using most major credit and debit cards, or by using PayPal. Although some payment options may not be available for all customers. Disclosure: Our company is the developer and vendor of Feedback Form PHP Script.